—Ken Hicks, CEO/chairman, Footlocker, Inc.
Take a random sampling of managers and executives and you will inevitably encounter the good, the bad, and the inept. But there are those rare souls who are excellent bosses, who achieve great results while retaining their staff’s loyalty, affection, and exemplary performance. Who are these elite performers—these Superstar leaders? And how can you become one? Superstar Leadership identifies key habits of the best and worst bosses. 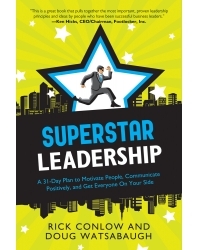 This 31-day book uses nine key performance drivers to evaluate and help leaders quickly increase results and sustain them. Each evaluation and activity hones your leadership skills, transforming you into a Superstar leader. Rick Conlow is the CEO and cofounder of WCW Partners, a global management consulting and training firm. Rick has helped numerous companies like Target, Costco, Andersen Windows, and Canadian Linen reduce complaints, improve profits, and increase sales. He has been a general manager, vice president, training director, program director, and national sales trainer, and consultant. Rick has authored 11 books, and regularly facilitates presentations to audiences of all sizes. Doug Watsabaugh is the COO and cofounder of WCW Partners. His knowledge of experiential learning and skill at designing change processes and learning events have enabled him to significantly improve the lives of thousands of individuals and hundreds of organizations in various industries, including Coca Cola, Accenture, Hasbro, 3M, and General Mills. Doug is the author of seven books.